With thy Needle & Thread: Cabin Fever!! Well it is 60 some degrees colder (with wind chill) today then it has been the past couple of days. Old mother nature is reminding us that it is only February and it is still winter. 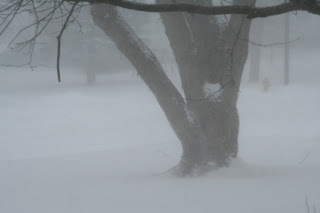 We are having a good old fashioned blizzard here today in Iowa. At times the neighbors homes are just blurry images. Think it is too nasty to venture outside today. 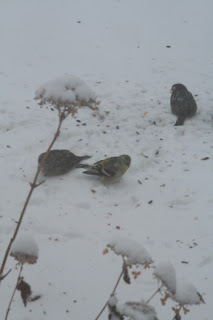 I will just stay at home, do some design work and take care of my dear feathered friends. I had so many visitors today....just a few pics to share with you! 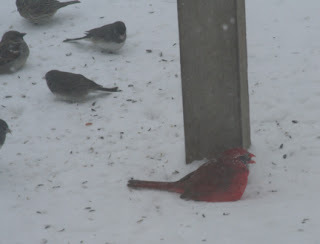 Mr. Cardinal decided to feed on the ground because the feeder above is loaded with house finches. In about mid to late February this guy will start to sing his beautiful courting song. He can also be seen feeding the female during their courtship....what a great guy! These are beautiful birds and I spend lots of time watching them throughout the year. A American gold finch dressed in his Winter feathers. His feathers will turn a brilliant yellow as Spring approaches. 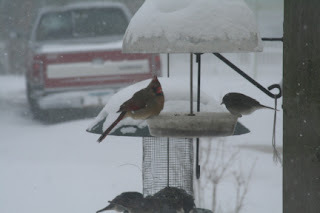 These little creatures visit the feeders in small flocks. Iowa's state bird. 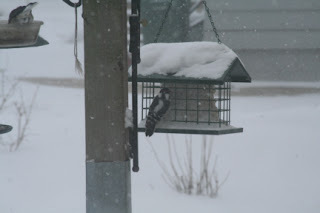 The little downy has decided he is going to have some suet for lunch. These little guys get very tame...will just sit on the post and watch me fill the feeder. 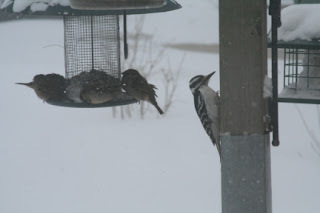 Here is the little Downy's big cousin the Hairy Woodpecker. His coloring and markings look just like the Downy, but this guy is much bigger. He is in for some suet as well. I have spent the day filling feeders and keeping the birds fed....now it tis time to put a pot roast in the oven for our dinner.